Comments: A speaker and ex. speaker jack were located under the chassis. A selenium rectifier was used in the bias circuit for models 5E4-A and 5F4. The spearkers were mounted off center in the lower left and upper right corners of the baffle. of all the Fender tweeds I really think this model has to be considered one of the best if not the best. Unless you’re playing a friggen’ stadium, I don’t imagine that you would need a tweed Twin (ever had to tell a drummer to play louder?). I am not a tech, but I know the circuit is similiar to a tweed Bassman (two 5881s and tube rectifier; 10″ Jensen Alnicos, presence, etc…). 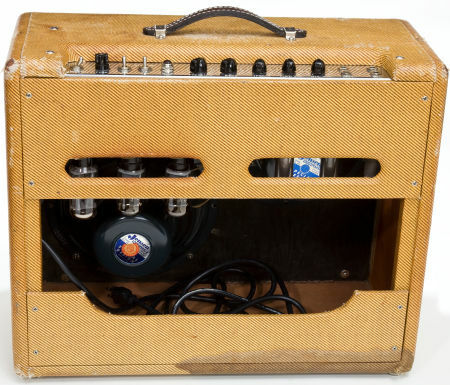 Imagine having that same gorgeous vintage tube tone just drenched with vintage Mojo and Tube Screamer like tone. But it is 1/2 the size and weight making it MUCH easier to carry and you don’t have to shatter the windows to reach clipping levels. Just mic’ it into the mix and you have pure tweed magic. I was lucky to find an all stock original. I would recommend buying a Victoria 35210. This, a Pro and a Bandmaster are the king of the tweeds, unless you are a true professional then you would want the Bassman and if you want to say completely clean with that magic tweed compression, then go for the Twin. I had a Victoria 80212 and for some reason it was not as loud as my old ’59 Fender and it broke up really easy. 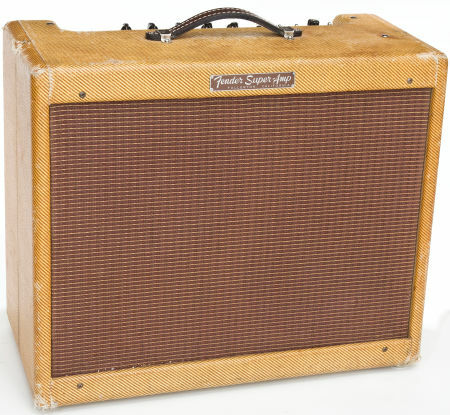 Sounded AMAZING, but if you can spare the extra $15,000, then I’d go with the Fender…. IF you can find one! I have a 1955 Super in my shop right now with the 5E4 circuit. The tube chart does list the tubes as 5U4GA, 6V6GT, 6V6GT, 12AX7, 12AX7, 12AY7. However, according to the schematic and layout diagrams, it should be: 5U4GA, 6V6GT, 6V6GT, 12AX7, 12AY7, 12AY7. It is not uncommon for Fender tube charts to be wrong. I think that an error was made in printing the tube charts, but rather than throw them out, they just used them up. I did not find the schematics of the 5E4, but the Tweed Super is the 5E4-A. But I agree, it is confusing, and on some webpages you will find just the opposite !!! 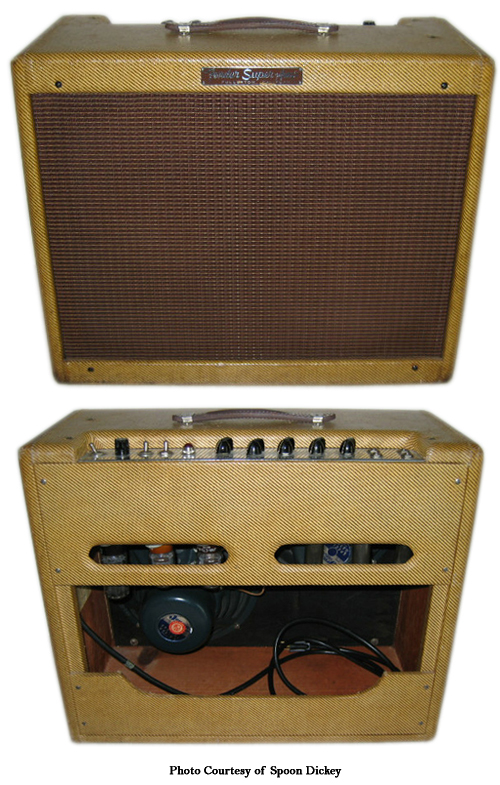 You will also find” Fender Super -amp ” which is the 5F4, and has 1 x 12ay7 and 2 x 12ax7.